Getting reviews from our customers means that we can keep track of how we’re performing, so we can continue to bring you the very best service. Over the past six months, 96% of our customers have said that they would buy from us again. Why are customer reviews important to us? With our large range of products, we want to make sure we help you find the perfect one for you. We know how helpful it is to read the opinions of customers who have already bought the products you’re interested in. That is why we work with Reevoo to bring you customer ratings and reviews on the products and services we sell. Reevoo reviews and ratings help to you gain a clearer understanding of a product or service, taking into account a selection of relevant features. You can choose to filter reviews by the most relevant reviews for each product, such as reviews from busy parents or business users. And if you’ve got a question, you can even “Ask an Owner”. Reevoo reviews and ratings are widely available on our product pages and reviews are always on the way for our latest products. A wide range of our products have Reevoo ratings available so you can make an informed decision when you’re shopping. There are three ways to view Reevoo ratings: on our product pages, on the product listing pages or using the sort filter. We have thousands of products that have been reviewed and rated by our customers. The Reevoo rating is shown on our product pages, with the option to find out more and if you’ve got a question you can even ‘Ask an owner’. As you’re scrolling through products on the listing page, you’ll be able to see at a glance the average star rating and the number of reviews the product has had. Only interested in the highest rated products? 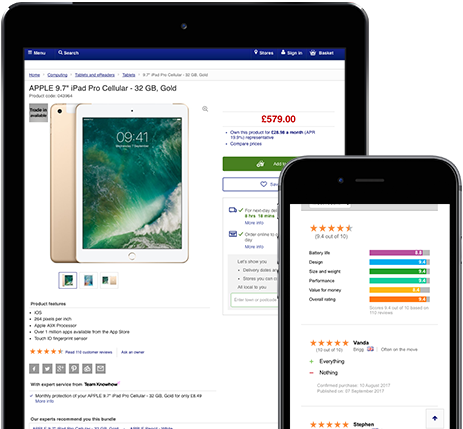 Use the customer rating sort option to sort the page with the highest rated products first, so you can see the most popular products without searching. Reevoo is an independent and unbiased provider of verified customer ratings and reviews. Reevoo never edit or censor any of the reviews they receive, whether they’re good or bad, and they don’t let businesses do so either. When you see the Reevoo logo, you can be sure you’re reading 100% genuine customer reviews.